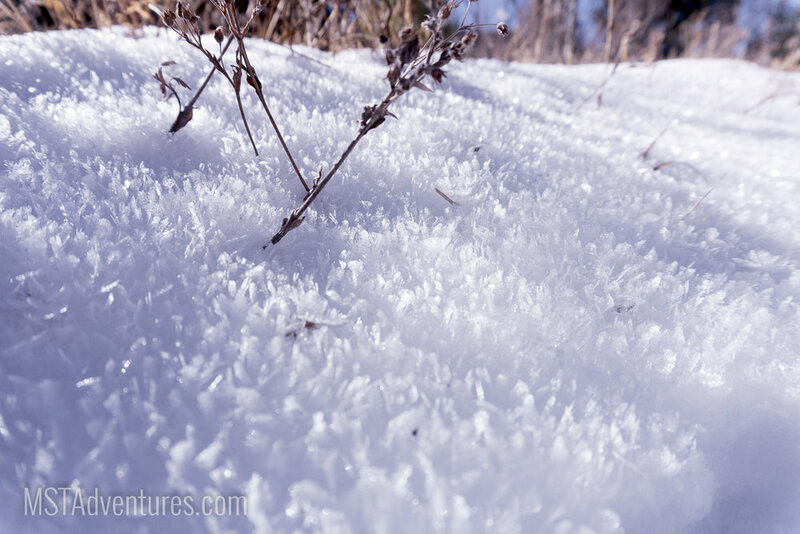 The warm weather has made for some interesting snow formations. So it may not be feet of beautiful powder, but there is definitely snow on Sandia Mountain. This Sunday I went snowshoeing with my two of my favorite people. Funny thing is, we were so excited for snowshoeing this year that we all bought new MSR snowshoes (Revo Explore and Revo Ascent) before the season started. We've definitely been itching to go try them out! We weren't sure exactly what we'd find when we got to the trailhead so we came prepared with both snowshoes and microspikes. At first it wasn't promising, so we started with our microspikes, but after an eighth of a mile we decided to turn back to the car and grab our snowshoes. The 10K trail, after getting past the first few hundred yards, had about 3-4" of snow over it's majority. Just enough snow to test out the new 'shoes! The 10k trail is a wonderful meander through the mostly Ponderosa Pine forest along the 10,000' elevation line. There were still some large rocks poking up, so we had to be careful where we stepped a few times, but overall it was a great choice to use the snowshoes. One of my favorite things about the Revo snowshoe is just how much they flex! You don't have to worry about breaking a stiff frame or having a sharp rock/branch puncture a fabric deck. The plastic decks contour and protect the feet really well. If you've ever been hiking with me, you know that I'm always packing at least one camera. This trip was light - only two small cameras and 4 lenses :D. Unfortunately stopping to take pictures all the time ("Hey go back, I like they way the light goes through the tree there!") is not the quickest way to hike. When we met up with the Osha loop trail, we changed our original plan and decided to cut this 3 mile loop and opt to head straight up to Del Agua Canyon Overlook. What an amazing view! It's only a couple miles from the trailhead, but makes you feel like you're in the middle of nowhere. The 10K trail and Crest Trail intersect at this overlook. After lunch, and some more photos, we packed up and headed back down via the Ellis Trail. Ellis is a very easy trail to follow as it is entirely through a long strip cleared of trees for utilities and service access. The downside is it goes straight up and down a series of small, but steep, hills. It's definitely a workout. If you use AllTrails.com (app or website), you'll notice that the 10K trail is listed as "hard" and Ellis as "moderate." I'd definitely say these two are switched! Most of the trail hugs the west side of the clearing, keeping it in shade for more of the day. There was actually about 5-6" of snow here - perfect! Will and Sharayah headed back on the Ellis Trail. We finished our hike along the road back down to our car. Overall this is a great 5.5 mile loop with a stunning view in the middle. I highly recommend it any time of year. 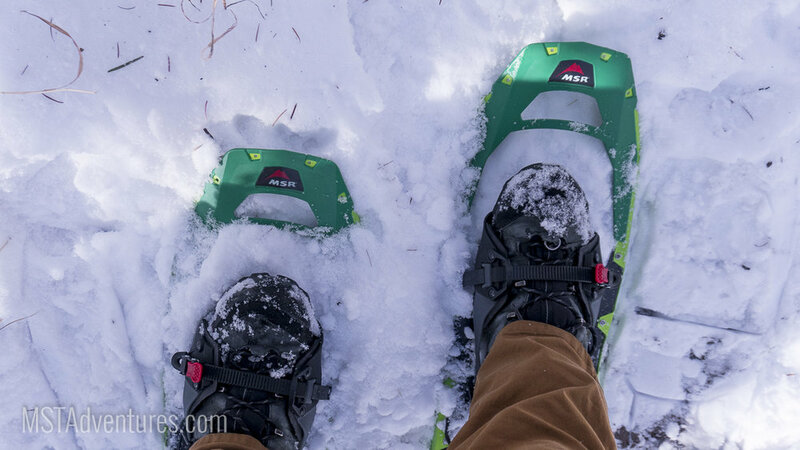 If you've ever wanted to try snowshoeing, but aren't sure about how - we've got you covered. This year MST Adventures is offering Guided Snowshoe Trips on Sandia Mountain. Each tour has a different focus, so you aren't just playing "follow the leader." If self exploration is more your style, but don't want to make the investment in your own snowshoes, we've got your back! We have MSR Revo, Shift, and Tyker snowshoes to rent for the whole family. The last stretch of the Ellis Trail.